I clicked the link fully intending to argue that you got it wrong and that PC White Cheddar was the best. Clearly, you got it right. Except PC is Superstore/Loblaws and not Sobey’s. Erin, I read your comment and my first reaction was “that’s what I said, isn’t it?” I evidently can’t brain today. Changing Sobeys to Loblaws. Hmmmm. USian here, and I’ve obviously been cheated of the good stuff. In fact, I made some Kraft (the premium kind) yesterday, and found it wanting as I always do. But I don’t have a good recipe for homemade, either. In fact, the best cheesy pasta I’ve had recently has been my own concoction with Italian cheeses. I cook the pasta, then toss it with a little good olive oil and a lot of really good shredded Italian cheese like a mix of parmesan and romano. I use an electric stove, so I do this in the cooking pot over the warm but turned-off burner until the cheese melts. Not to-die-for, but a very nice pasta dish. Kraft recently changed their recipe for Kraft Dinner, which destroyed the only real reason to eat it these days: nostalgia. Ooh gimmie! I’d love to try that. I recently posted about how to make mac and cheese while camping/backpacking with a small pot/stove and no cooler – I’d love to try this stuff that way if it’s as good as you say! 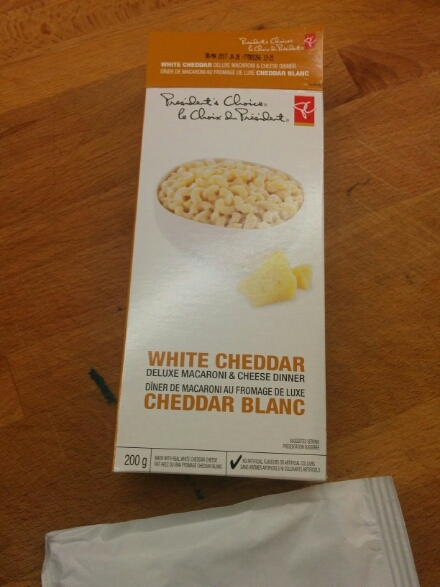 I do not understand boxed mac n cheese. I learned about mac n cheese, made it, love it, but I do not understand that box thingy. On the other hand, I grew up in a home where a particular kind of boxed spaghetti with tomato sauce was a special treat…. This is one of the reasons that my family shops at Superstore. I will be bringing back as many boxes as possible. Alas, there is a weight allowance – but then, it’s not like I need any of my other stuff.